Why Use A Torque Wrench? 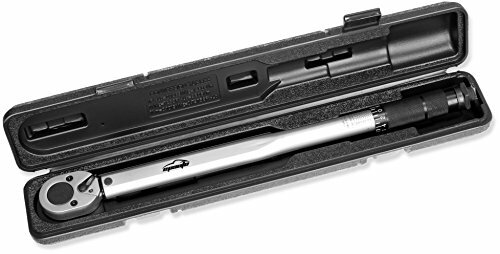 Choosing the best torque wrench you can afford is one of the best auto tool investments you can make. 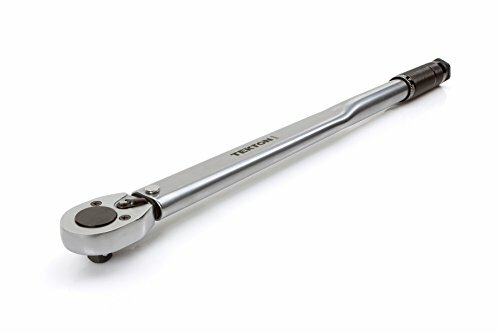 Contrary to what some DIY car enthusiast might think, a torque wrench is not only used when you need "tightening the crankshaft bolts". 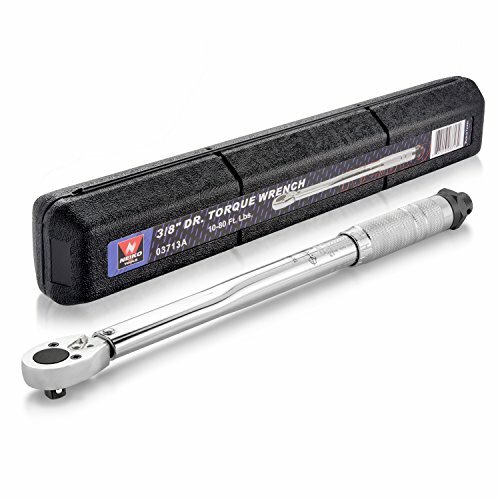 Truth is, you should be using a torque wrench for pretty much every nut and bolt on your car or truck. 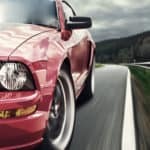 Manufacturers are constantly testing new alloys, plastics, and other materials to enhance fuel efficiency, overall weight and power. So it's really important to be extra careful when tightening parts, not only because you may not tighten enough, but also to avoid breaking a delicate part. Our favourite all round torque wrench at the moment is the 1/2 inch micrometer torque wrench from CDI. Check out the full reviews below and we've also included some helpful tips for using and storing a torque wrench. What Are the Different Types of Torque Wrenches? The CDI Torque 2503MFRPH is a dual-scale adjustable micrometer torque wrench with ½” drive size. In case you are not aware, CDI is actually the industrial brand of Snap-On. As you may expect, products under CDI brand are high-quality and made for tough jobs. Besides being a heavy-duty wrench, the CDI Torque 2503MFRPH is highly precise. You can rely on its readings from 20% to 100% of full scale. Another welcome feature is its 24.4” length which is ideal to apply the right amount of force without much effort. Precision reading from 50 ft. lb. to 240 ft. lb. Typical applications include crankshaft, cylinder head, connecting rods, engine bracket and any other application involving tightening in the range of 60 ft. lb. to 150 ft. lb. This particular torque wrench is highly advisable for professional use and/or for jobs that require high-precision assemblies. Torque Range: 30-250 ft. lb. Mechanical readings, dual scale, calibrated dual direction. The TEKTON 24340 is definitely a suitable torque wrench for DIY car enthusiasts. Combines good quality with an affordable price and enough precision for casual assembly tasks. What makes the TEKTON 24340 special is its unbeatable value. 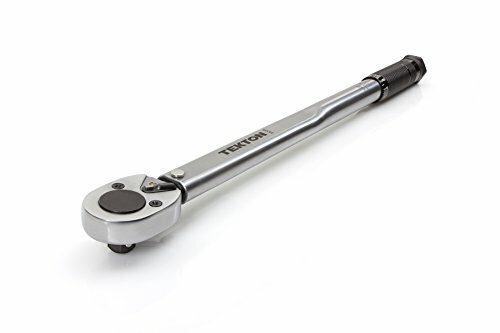 You won’t normally find another good quality ½-Inch drive torque wrench at the price point TEKTON offers. In practice, even when both advertise the same accuracy, the TEKTON cannot compete with the precision of the CDI. Make no mistake, the TEKTON 24340 is good enough for casual DIY assembly projects but it may fall short for everyday high-precision professional tasks. Precision reading from 65 ft. lb. to 195 ft. lb. Typical applications include crankshaft, cylinder head, connecting rods, engine bracket and any other application involving tightening in the range of 80 ft. lb. to 150 ft. lb. This particular torque wrench is NOT advisable for professional usage and/or for jobs that require high-precision assemblies. However, this tool is highly advisable for DIY car owners that require a reliable torque wrench. Torque Range: 25-250 ft. lb. The EPAuto ST-010-1 torque wrench is another good option for DIY car enthusiasts. In a similar fashion to the TEKTON 24340 it combines quality, adequate precision, and excellent price. Precision reading from 40 ft. lb. to 110 ft. lb. Typical applications include crankshaft, cylinder head, connecting rods, engine bracket and any other application involving tightening in the range of 50 ft. lb. to 100 ft. lb. This particular torque wrench is NOT advisable for professional use and/or for jobs that require high-precision assemblies. However, this tool is highly advisable for DIY car owners that require a reliable torque wrench for casual projects. Torque Range: 10-150 ft. lb. The TEKTON 24335 torque wrench has almost the same specifications of the EPAuto ST-010-1. Both wrenches are intended for DIY car enthusiasts, however going by other reviews, the TEKTON appears to be more durable and precise. The TEKTON 24335 is one of the best value DIY torque wrenches in this price range. It's a good all rounder with a decent torque range that makes it suitable for a wide range of tasks. The socket ratchet works in both directions (torques in clockwise only) and the shorter 18 inch handle makes it suitable for working under your truck or in the engine bay. It's not going to be the most accurate torque wrench at lower torques, but it's a great choice for occasional use and for torquing wheel bolts and other mid range parts. Precision reading from 30 ft. lb. to 120 ft. lb. Typical applications include crankshaft, cylinder head, connecting rods, engine bracket, tire lug nuts and any other application involving tightening in the range of 50 ft. lb. to 110 ft. lb. This particular torque wrench is NOT advisable for professional use and/or for jobs that require high-precision assemblies. However, this tool is highly advisable for DIY car owners that require a reliable torque wrench. Usually, ⅜-Inch drive torque wrenches are not as common as their ½ counterparts. Still, there are many applications for them. The Neiko 03713A is an excellent choice when it comes to any job that requires a ⅜-Inch drive torque wrench. Its cost-benefit ratio is unquestionably the key advantage of the Neiko 03713A. For a ridiculous price, you can buy a tool that is great for occasional use or one off jobs that require a torque wrench. Precision reading from 30 ft. lb. to 65 ft. lb. Typical applications include small crankshafts, small cylinder heads, connecting rods, engine accessories, and any other application involving tightening in the range of 20 ft. lb. to 70 ft. lb. Torque Range: 10-80 ft. lb. The Craftman 9-13919 is, without any doubt, the best digital ½” torque wrench you can buy for everyday usage. If you are looking for a robust, accurate and easy to read digital torque wrench then look for further, the Craftman 9-13919 is all you need. Being digital is obviously a key difference from the rest of ½” torque wrenches on this list. But the Craftman 9-13919 goes beyond and offers an excellent product, with a high-quality finish, accurate readings, robust construction, and a comfortable handle. Precision reading from 35 ft. lb. to 235 ft. lb. Typical applications include crankshaft, cylinder head, connecting rods, engine bracket, wheels lug nuts, and any other application involving tightening in the range of 40 ft. lb. to 230 ft. lb. Digital readings, dual scale, calibrated dual direction. As explained before, CDI is actually an industrial brand of Snap-On. The CDI 1002CF3 certainly won’t disappoint you regarding functionality, quality, and precision. 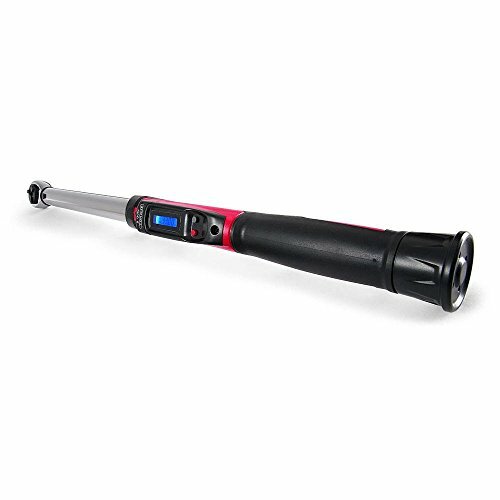 This is the best 3/8” torque wrench in the market, period. The CDI 1002CF3 is a technological wonder, exhibiting all the benefits you may want into a torque wrench. Unsurpassed precision, heavy-duty construction, the best handle on its class, digital readings, and a very useful feature that allows it to display (in real time) the actual torque being applied. Precision reading from 15 ft. lb. to 95 ft. lb. Typical applications include small crankshafts, cylinder heads, connecting rods, wheels lug nuts, and any other application involving tightening in the range of 15 ft. lb. to 95 ft. lb. Torque Range: 10-100 ft. lb. Digital readings, dual scale, calibrated dual direction, real-time readings. 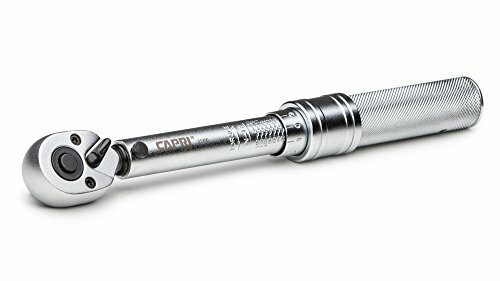 The Capri 31200 is the only torque wrench on this list with a ¼” drive size. Usually, automotive applications have little use for such a small wrench. On the other hand, motorcycle, aeronautic and hobbyists applications do require it, and very often. Without any doubt, its precision. The Capri 31200 is one of the most accurate torque wrenches on this list. That is not a surprise taking into account that ¼” drives are used for small and delicate assemblies. Precision reading from 35 in. lb. to 145 in. lb. Typical applications include automotive, motorcycle, aeronautic and hobbyists. This particular torque wrench is highly advisable for professional use and/or for jobs that ultra high-precision assemblies. Torque Range: 20-150 in. lb. (2.8 - 16.4 Nm) . The last torque wrench of this list is no other than the ACDelco ARM601-3. Similar than the CAPRI, this is an ultra-high precision tool suitable for aeronautics, motorcycles, hobbyists and specific automotive applications. There is a long list of unique features that make the ACDelco ARM601-3 truly different from the rest. It delivers unsurpassed accuracy, four scales to choose from, digital readings, real-time torque, and more. Accurate reading from 3 ft. lb. to 35 ft. lb. This particular torque wrench is highly advisable for use by professional mechanics and/or for jobs that ultra high-precision assemblies. Torque Range: 2-37 ft. lb. (2.71 - 50 Nm) . Digital readings, quadruple scale, calibrated dual direction, real-time readings. Beam Torque Wrench: while is one of oldest types of torque wrench, it’s still considered one of the more accurate. Consist of a calibrated mechanical dial that indicates the actual torque applied. 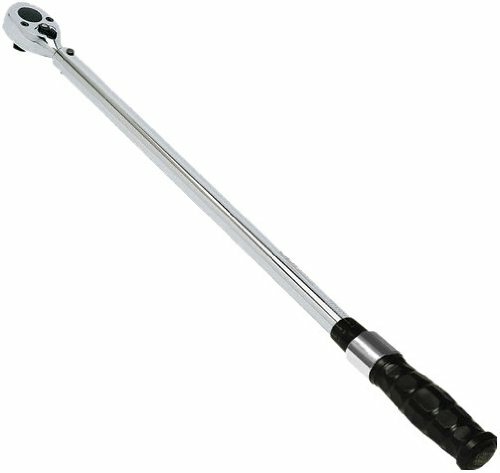 Click Torque Wrench: this is the most widely known type of torque wrench. Consist of an adjustable micrometer and a ratchet type mechanism. When the desired torque is reached an internal clutch alert the user producing a distinctive “click” sound. Dial Torque Wrench: is very similar to the beam type torque wrench but incorporates a dial for easy reading of the actual torque applied. 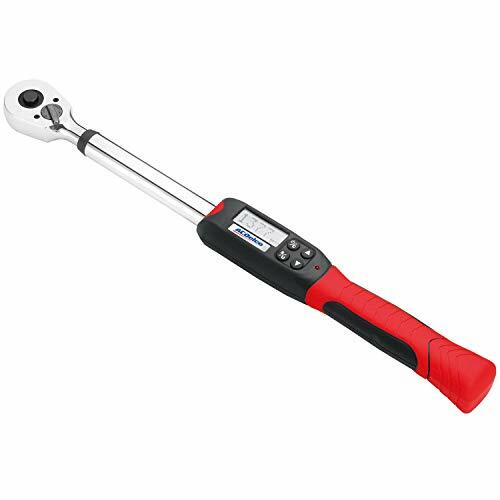 Digital Torque Wrench: it’s the most recent kind of torque wrench, consisting of an electromechanical head and electronic transductor that send a signal to a digital display. Depending on the model many other functions can be included. Top models display the actual torque applied and also warns the user when the preset force is reached. Type of application: it is a delicate or high-precision application? Like aeronautical assemblies or crucial automotive assemblies like cylinder heads or crankshaft? If the answer is yes, then try to choose a good quality product. Always keep in mind that a torque wrench is supposed to be a precision instrument, it is not another ratchet. A cheap tool will behave as expected delivering inaccurate readings and therefore can cause several consequences. Required torque: depending on your application you may need to apply a big torque. If that’s the case, prefer long handles because they will ease the task. The longer the handle the less effort required. Daily Usage: if you are planning to use the torque wrench on a daily basis then always prefer a good quality brand, preferably, an industrial-grade brand. Even when the initial cost will be certainly higher, in the long term, your total cost of ownership will be lower because these brands manufacture products guaranteed to last several years. Using a cheap brand for daily usage will result in poor results and damaged wrenches in the short-term. (Optional) Check calibration: depending on the kind of job at hand, you may need to check the calibration of your tool. Usually, this is done with another (higher-quality, higher accuracy) torque wrench that is kept stored for this only purpose. Keep in mind this is not an official calibration or certification, it’s only a pre-check prior to critical tasks. Pre-Tighten the Bolts: using a ratchet tighten the bolts until you feel you reach the point of applying force. Adjust the Wrench: depending on the type of torque wrench, adjust the desired torque level. Apply the Torque: using the appropriate socket apply force until you reach the desired torque level. You will know when you achieve the torque depending on the torque wrench type. A click sound on mechanical wrenches or a “beep” sound on digital ones. Release the Wrench Adjustment when done: it is crucial to remember that torque wrenches are precision instruments. Before storing the tool you need to reset the torque wrench to zero. This prevents internal damage to the tool and keeps it calibrated for a longer period of time. 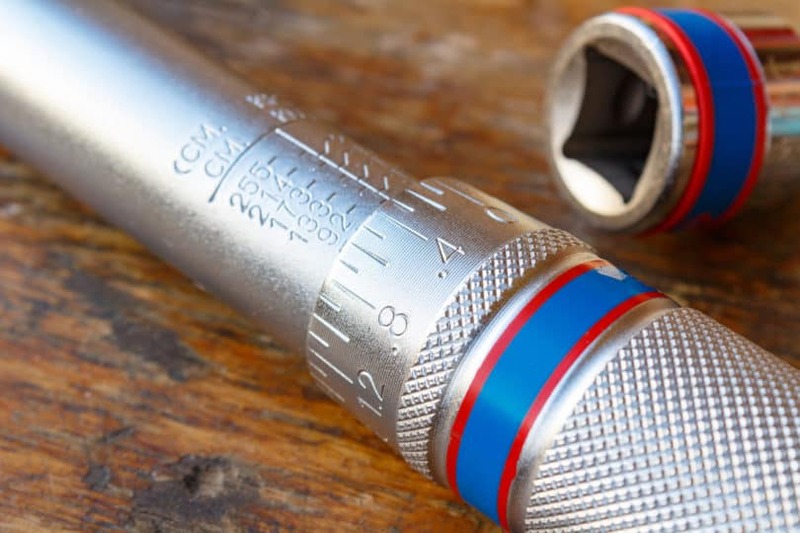 A final recommendation regarding torque wrench usage is that even when they are calibrated in both directions they are not intended to be used to loose bolts, only to tighten them. A bad use of this instrument will decalibrate the tool very quickly.